Himlung Himal Expedition is one of the recently opened mountain for climbing and is located between Manaslu and Annapurna ranges. It is one of the most technically challenging Expedition Mountain in Nepal above the 7000m but it is not impossible many expedition lover or expedition group team successfully summit this mountain in the past expedition seasons. The Himlung expedition takes you through remote village’s lies between Nepal and the Tibet border. The trek passing through scenic Tibetan villages of Nar - Phu. Those villages were located at the upper border of the pastures belong to Phu. Himlung Himal Expedition and trekking trail go through high peaks and passes, glaciers, remote villages, narrow gullies, forests, rocks, springs, Gompas, and unique cultural settlements. Himlung Himal expedition also offers a unique culture and beautiful mountain views of Nandadevi, Rajramba, Lamjung Himal, Kappa Chuli Peak and many more. Where the expedition makes more exciting with the combination of Natural beauty and cultural harmony of Mountain peoples. Climbing Himlung Himal isn’t of particularly difficult is a very beautiful course of alpinism in altitude from its Base Camp to the Summit. The trekking trail route to Phu Gaon from Manang is newly opened and fewer tourists have visited, so far. These routes are accomplished with high peaks and pass, glaciers, remote villages, narrow gullies, beautiful forests, amazing rock and spring formations, Gompas and unique varied cultures. It is a remote and restricted areas of Nepal so the only few tourists visit in this region. This is the amazing country beyond, a wild and unique scenic hilly and mountainous full of ethnic people, rapid rivers and pristine forest. Due to its amazing feature of this region traveler will expect virgin Nature, off the beaten path, Mysterious culture and majestic mountain views. 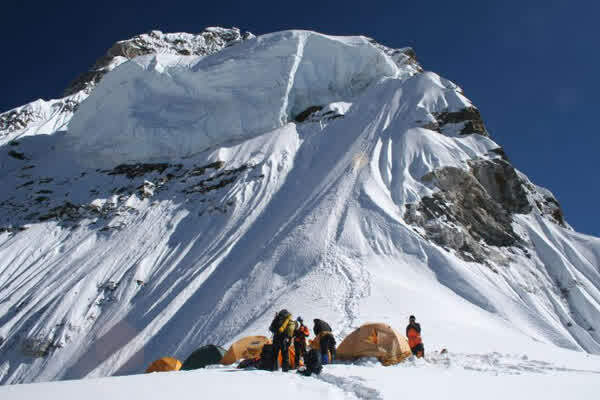 We Alfresco Adventure Travel established the base camp at an altitude of 4900 m. our cure member of Himlung Himal expedition team will set up camp and other all the necessary preclusion for the climbing and overnight stay, like fixed rope, camping areas and so on. 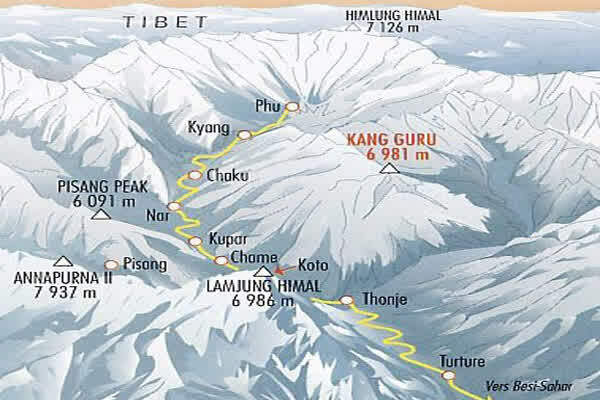 Generally, high camps will be set up in three steps for easy access to reach the Summit. 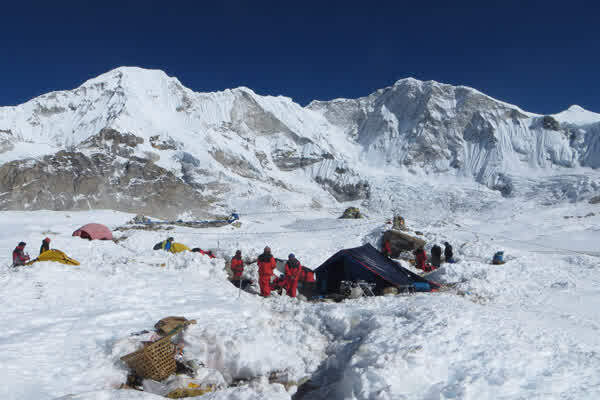 The high camp is set up above the base camp the Camp I is at the height of 5450m, Camp II at 6000m and Camp III at 6350m. While successfully summit the Mt. Himlung Himal and returns to camp 3rd and after that descend to the Base camp on the next day. Those two mountain Himlung Himal and the Mt. Baruntse are the alternative peaks to each other for an expedition during the spring because snow condition on one of the peaks are not consistent. Himlung is one of the spectaculars pears for expedition isolated on the remote location. Peak royalty both, national park fees and govt. taxes. Cook(s) and necessary kitchen staff. All food including available high altitude food for both trek and climb. Best quality high altitude tents. 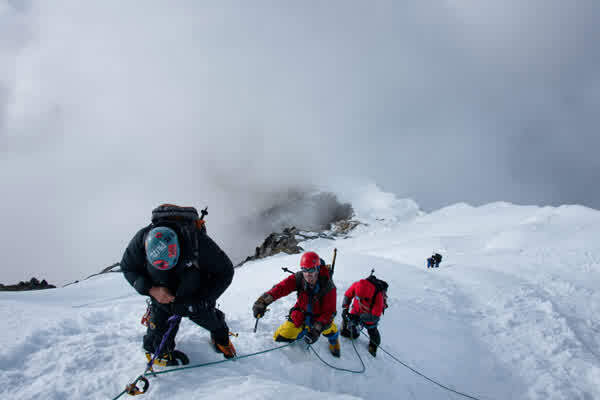 Insurance of climbing Sherpa, local team members and Liaison officer. Arrangement of necessary official documents. Royalty of satellite phone, film permit etc. The group must trek in/out at same date, if otherwise changed pre-hand.